An accessible bathroom is crucial for any home with a senior or disabled resident. When someone loses aspects of their mobility, there are often activities in their daily life that are taken for granted. Simple tasks like showering, bathing or even using the toilet present unforeseen challenges. The Centers for Disease Control and Prevention found that in one year, there were nearly 235,000 people were treated in hospital emergency rooms for non-fatal injuries that occurred in the bathroom. An accessible bathroom is a legitimate concern as people age, and as physical health declines. Bathtubs, showers and toilets can all present significant safety risks that should be addressed in a home with a senior or disabled resident. Luckily, there are some easy steps to creating an accessible bathroom without a remodel. Bathtub Lift – A bathtub lift allows you to soak in the tub without bending down. The user can simply sit down on the lift, hit the button, and lower themselves into the tub. Some have a reclining option on the back for a more relaxing experience. This is an easy way for the elderly or disabled to still be able to enjoy soaking in the tub. 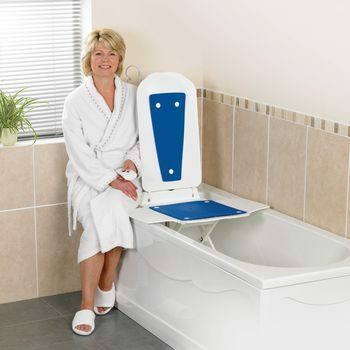 Raised Toilet Seat – This is an affordable way to help people who have difficulty sitting down or standing up from the toilet. A raised toilet seat provides a comfortable, hygienic means for using the bathroom. They have locks on them to prevent the seat from sliding on the surface of the toilet. Bathtub Grip – For those who simply need an easier method for getting in and out of the tub, a bathtub grip can help prevent falls and accidents. It’s a way to gain the leverage needed to get in or out of the tub on your own. Portable Shower – If you’re not looking to do a full remodel to create an accessible bathroom, a portable shower is an excellent way for those in a wheelchair to get clean. Warm water comes from the faucet and the waste water can be returned into the bathtub or sink. Showers can take place anywhere in the home. A lot of modifications become necessary when someone is confined to a wheelchair, or explores the process of aging in place. These are just a few ideas to make creating an accessible bathroom easier.